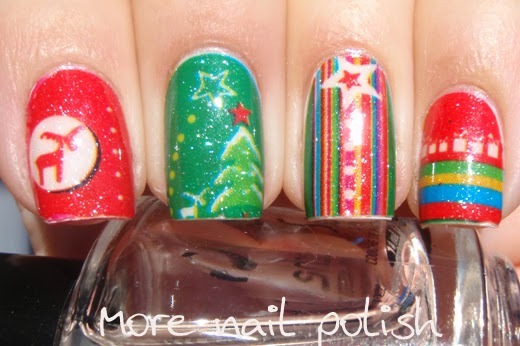 I've cheated a bit with some quick Christmas nail designs. 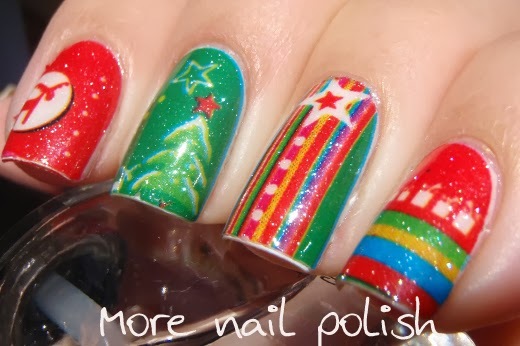 At this time of year when time is of a premium, I'll sometimes grab the quickest thing to put on my nails. 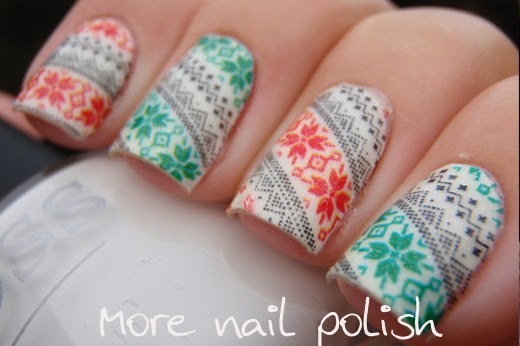 That's what I did with both these nail designs. These are Joyou brand nail strips that I purchased from the Born Pretty Store (although their site doesn't say what brand they are). The are listed as "14pcs Luminous Glow in Dark Nail Art Stickers Delicate Christmas Ornaments Snowflakes Pattern" or item number #9836, and this first one is design number #6. The pack comes with 7 different size nail strips and each one has a unique design on them. They are very strong, very stretchy, very sticky and feel a bit thick when you first peel one off, but as soon as it's on your nail it doesn't feel thick at all. I was able to peel these off my nail and reposition them several times without them ripping. 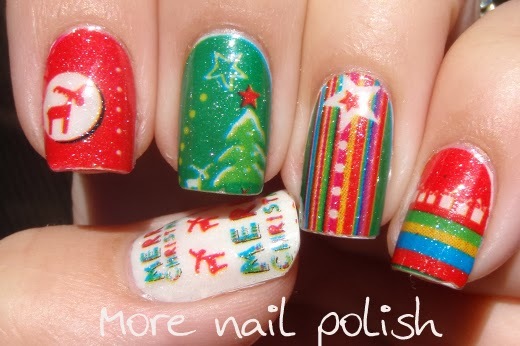 The printing on these Christmas designs is really excellent, bright colours and sharp edges. They also have a silver shimmer on them too. 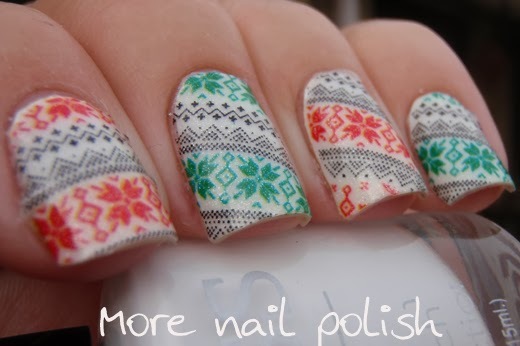 One thing that surprised me was that where you can see white on my nails, the nail strips are transparent. Therefore I had to paint white polish on my nails first otherwise you would see through to the bare nail (which is fine if that's how you want to wear them). Finally, like the description says, they really do glow in the dark! 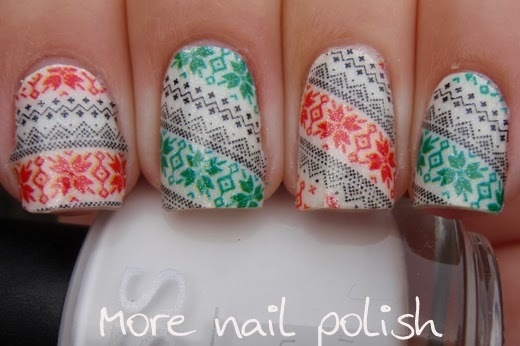 Here is the second set I've worn, design #3, which is a red and green Christmas jumper design. Again I had to paint white polish underneath, otherwise these were see through. I made myself wear one of these designs on one finger on my right hand for a full week, just so I could test out the wear. By day 6 and 7, the tip was looking worse for wear, I'm actually amazed how well it stood up. 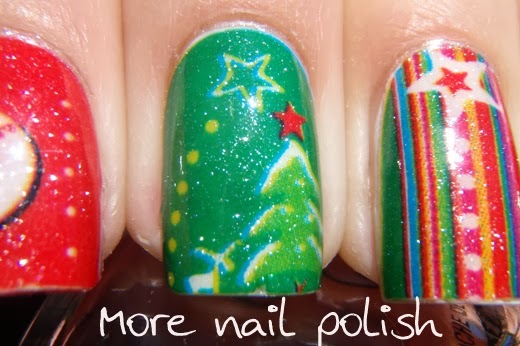 I did get some lifting around the edges at day 3, so I applied a layer of top coat on day 3, 4 and 5. At the end of day 5, I felt the top coat was feeling too thick. Having already removed the rest of the strips, I knew that nail polish remover doesn't effect these, so I cleaned back all the top coat and went back to the plain strip for day 6 and 7. I think it was using nail polish remover though, which got under the tip and removed the white polish underneath, which resulted in my major tip wear on days 6 and 7. Despite nail polish remover not working on these, they are actually quite easy to remove. The instructions say to soak you hands in warm water for 8 minutes - aint no one got time for that! So I just gently peeled them off after my shower. They left a sticky residue on the white polish, but that was all easily removed with nail polish remover. 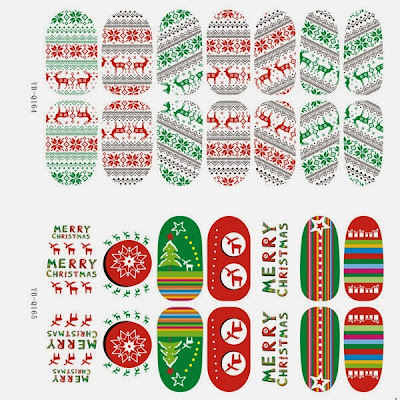 Such a detailed review on a Christmas nail strip design is probably a little useless now, especially as there is no way you will receive your order from the Born Pretty Store in time for Christmas. However, they are only .99 cents a pack, and they don't dry out. So they are probably well worth purchasing now to use next year. 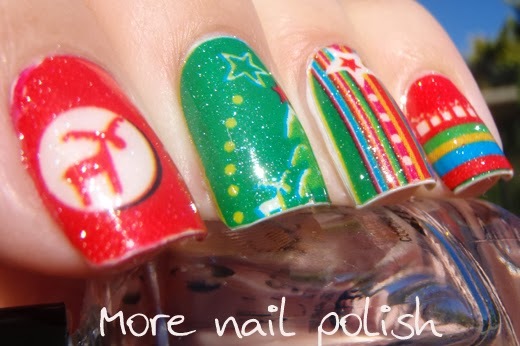 They are also fantastic things to put into Secret Santas gifts for your nail polish friends. 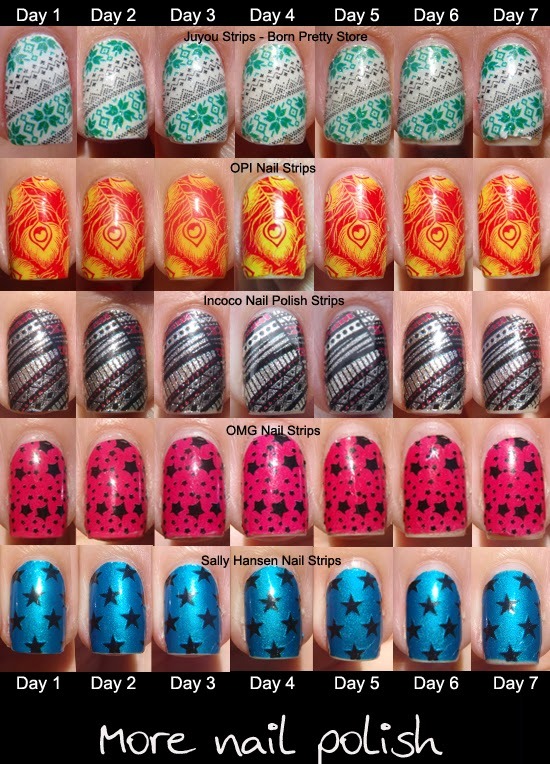 The Born Pretty Store also has more nail strips from this brand, including scenery designs and various animal faces. I grabbed a few of each sort, and while the quality and wear is the same, the printing on them is nowhere near as good as these Christmas designs, they seem blurry and not nearly as sharp as the website shows them. I will show some of them in the New Year. I love the first ones and YAY glow in the dark! 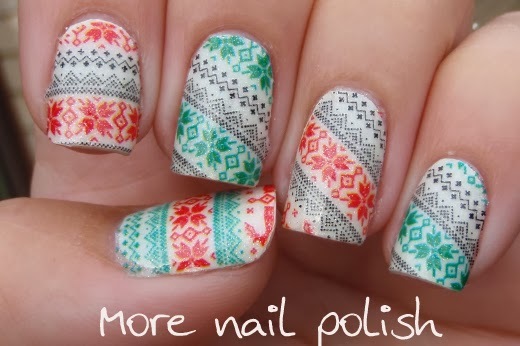 I really like the sweater ones, they are so cool!